Jacques-Benigne Bossuet (September 27, 1627 - April 12, 1704) was a French bishop, theologian, and renowned pulpit orator and court preacher. He was also an important courtier and politician at the court of Louis XIV. Bossuet was a staunch advocate of the theory of political absolutism; he made the argument that government was divine and that kings received their power from God. The notion of the divine rights of kings was an important theoretical pillar of monarchy in Europe, supported by the Holy Roman Empire. Considered by many to be one of the most brilliant orators of all time and a masterful French stylist, the works best known to English speakers are his three great orations delivered at the funerals of Henrietta Maria, widow of Charles I of England (1669), her daughter, Henrietta Anne, Duchess of Orléans (1670), and the great soldier Condé (1687). 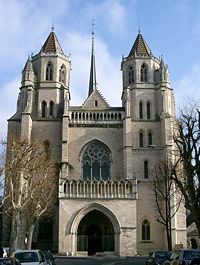 The Cathédrale St Bénigne in Bossuet's hometown of Dijon. Bossuet was born at Dijon. He came from a family of prosperous Burgundian lawyers on both his paternal and maternal side; his ancestors had held legal posts for at least a century. He was the fifth son born to Beneigne Bossuet, a judge of the parlement (a provincial high court) at Dijon, and Madeleine Mouchet. His parents decided on a career in the church for their fifth son, so he was tonsured at age eight. The boy was sent to school at the Collège des Godrans, a classical school run by the Jesuits of Dijon. When his father was appointed to the parlement at Metz, Bossuet was left in Dijon under the care of his uncle Claude Bossuet d'Aiseray, a renowned scholar. At the Collège des Godrans, he gained a reputation for hard work: fellow-students nicknamed him Bos suetus aratro an "ox broken in to the plough." His father's influence at Metz allowed him to obtain for the young Bossuet a canonicate in the cathedral of Metz when the boy was just 13-year-old. St. Etienne's Cathedral in Metz, where Bossuet was made a canon at age 13. In 1642, Bossuet enrolled in the Collège de Navarre in Paris to finish his classical studies and to begin the study of philosophy and theology. His mentor at Navarre was the college's president, Nicolas Cornet, the theologian whose denunciation of Antoine Arnauld at the Sorbonne in 1649 was a major episode in the Jansenist controversy. For the time being, however, Cornet and Arnaud were still on good terms. In 1643, Arnaud introduced Bossuet to the Hôtel de Rambouillet, a great center of aristocratic culture and the original home of the Précieuses. Bossuet was already showing signs of the oratorical brilliance which served him so well throughout his life. On one celebrated occasion at the Hôtel de Rambouillet, during a dispute about extempore preaching, the 16-year-old Bossuet was called on to deliver an impromptu sermon at 11:00 PM. Voiture famously quipped: "I never heard anybody preach so early nor so late." 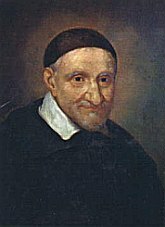 St. Vincent de Paul, who served as Bossuet's spiritual director during his period of retirement, 1650-52. Bossuet became a Master of Arts in 1643. He held his first thesis (tentativa) in theology on January 25, 1648, in the presence of the Prince de Condé. Later in 1648, he became a sub-deacon at Metz. He became a full deacon in 1649. During this period, he preached his first sermons. He held his second thesis (sorbonica) on November 9, 1650. Then, in preparation for the priesthood, he spent the next two years in retirement under the spiritual direction of St. Vincent de Paul. In January 1652, Bossuet re-entered public life, as he was named Archdeacon of Sarrebourg. He was ordained a priest on March 18, 1652. A few weeks later, he defended his doctoral work and became a Doctor of Divinity. 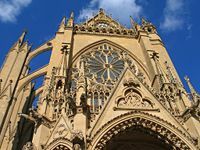 He spent the next seven years at Metz, where his father's influence had got him a canonry at age 13 and where he now also had the office of archdeacon. He was plunged at once into the thick of controversy; for nearly half of Metz was Protestant, and Bossuet's first appearance in print was a refutation of the Huguenot pastor Paul Ferry (1655), and he frequently engaged in religious controversies with Protestants (and, less regularly, with Jews) during his time at Metz. To reconcile the Protestants with the Roman Catholic Church became the great object of his dreams; and for this purpose he began to train himself carefully for the pulpit, an all-important center of influence in a land where political assemblies were unknown, and novels and newspapers scarcely born. His time at Metz was an important time for developing his pulpit oratory and for allowing him to continue his studies of Scripture and the Fathers. He also gained political experience through his participation in the local Assembly of the Three Orders. 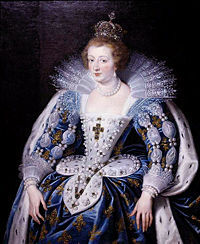 Anne of Austria, who was impressed by Bossuet's preaching in 1657. In 1657, in Metz, Bossuet preached before Anne of Austria, mother of Louis XIV. As a result he received the honorific title of "Counselor and Preacher to the King." Bossuet quickly gained a reputation as a great preacher, and by 1660 he was preaching regularly before the court in the Chapel Royal. In 1662, he preached his famous sermon "On the Duties of Kings" to Louis XIV at the Louvre. Interior of the Église Saint-Germain-l'Auxerrois de Paris, where Bossuet often preached to Louis XIV. In Paris the congregations had no mercy on purely clerical logic or clerical taste; if a preacher wished to catch their ear, he must manage to address them in terms they would agree to consider sensible and well-bred, though Bossuet cared little for their good opinion. Having very stern ideas of the dignity of a priest, he refused to descend to the usual devices for arousing popular interest. The narrative element in his sermons grew shorter with each year. He never drew satirical pictures, like his great rival Bourdaloue. He would not write out his discourses in full, much less memorize them; of the 200 printed in his Works all but a fraction are rough drafts. No wonder ladies like Mme de Sévigné forsook him, when Bourdaloue dawned on the Paris horizon in 1669; though Fénelon and La Bruyère, two much sounder critics, refused to follow their example. Bossuet possessed the full equipment of the orator, voice, language, flexibility, and strength. He never needed to strain for effect; his genius struck out at a single blow the thought, the feeling and the word. What he said of Martin Luther applies peculiarly to himself: he could fling his fury into theses, and thus unite the dry light of argument with the fire and heat of passion. These qualities reach their highest point in the Oraisons funèbres (Funeral Orations). Bossuet was always best when at work on a large canvas; besides, here no conscientious scruples intervened to prevent him giving much time and thought to the artistic side of his subject. The Oraisons stood midway between the sermon proper and what would nowadays be called a biographical sketch. At least, that was what Bossuet made it; for on this field he stood not merely first, but alone. One-hundred-and-thirty-seven of Bossuet's sermons preached in the period from 1659 to 1669 are extant, and it is estimated that he preached more than a hundred more which have since been lost. Apart from state occasions, Bossuet seldom appeared in a Paris pulpit after 1669. A favorite of the court, in 1669, Bossuet was gazetted bishop of Condom in Gascony, without being obliged to reside there. He was consecrated on September 21, 1670, but he resigned the bishopric when he was elected to the French Academy in 1671. 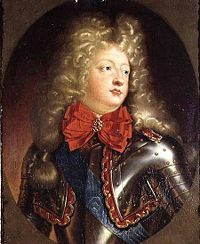 The Grand Dauphin, only child of Louis XIV. Bossuet served as his tutor 1670-81. On September 13, 1670, he was appointed tutor to the Dauphin, only child of Louis XIV, and then a boy of nine. The choice was scarcely fortunate. Bossuet unbent as far as he could, but his genius was by no means fitted to enter into the feelings of a child; and the dauphin was a cross, ungainly, sullen lad, who grew up to be a merely genealogical incident at his father's court. Probably no one was happier than the tutor, when his charge's sixteenth birthday came round, and he was promptly married off to a Bavarian princess. Still the nine years at court were by no means wasted. Bossuet's tutorial functions involved composing all the necessary books of instruction, including not just handwriting samples, but also manuals of philosophy, history, and religion fit for a future king of France. Among the books written by Bossuet during this period are three classics. First came the Traité de la connaissance de Dieu et de soi-même (1677), then the Discours sur l'histoire universelle (1679, published 1682), lastly the Politique tirée de l'Ecriture Sainte (1679, published 1709). The three books fit into each other. The Traité is a general sketch of the nature of God and the nature of man. The Discours is a history of God's dealings with humanity in the past. The Politique is a code of rights and duties drawn up in the light thrown by those dealings. Not that Bossuet literally supposed that the last word of political wisdom had been said by the Old Testament. His conclusions are only drawn from Holy Scripture, because he wished to gain the highest possible sanction for the institutions of his country and to hallow the France of Louis XIV by proving its astonishing likeness to the Ancient IsraelIsrael of King Solomon. Then, too, the veil of Holy Scripture enabled him to speak out more boldly than court-etiquette would have otherwise allowed, to remind the son of Louis XIV that kings have duties as well as rights. Louis had often forgotten these duties, but Louis' son would bear them in mind. The tutor's imagination looked forward to a time when France would blossom into Utopia, with a Christian philosopher on the throne. That is what made him so stalwart a champion of authority in all its forms: "le roi, Jesus-Christ et l'Eglise, Dieu en ces trois noms," he says in a characteristic letter. And the object of his books is to provide authority with a rational basis. For Bossuet's worship of authority by no means killed his confidence in reason; what it did was to make him doubt the honesty of those who reasoned otherwise than himself. The whole chain of argument seemed to him so clear and simple. Philosophy proved that God exists, and that He shapes and governs the course of human affairs. History showed that this governance is, for the most part, indirect, exercised through certain venerable corporations, as well civil as ecclesiastical, all of which demand implicit obedience as the immediate representatives of God. Thus all revolt, whether civil or religious, is a direct defiance of the Almighty. Oliver Cromwell becomes a moral monster, and the revocation of the Edict of Nantes is the greatest achievement of the second Constantine. Not that Bossuet glorified the status quo simply as a clerical bigot. The France of his youth had known the misery of divided counsels and civil war; the France of his manhood, brought together under an absolute sovereign, had suddenly shot up into a splendor only comparable with Ancient Rome. Why not, then, strain every nerve to hold innovation at bay and prolong that splendor for all time? Bossuet's own Discours sur l'histoire universelle might have furnished an answer, for there the fall of many empires is detailed. But then the Discours was composed under a single preoccupation. To Bossuet the establishment of Christianity was the one point of real importance in the whole history of the world. He totally ignores the history of Islam and Asia; on Greece and Rome he only touched in so far as they formed part of the Praeparatio Evangelica. And yet his Discours is far more than a theological pamphlet. While Pascal might refer the rise and fall of empires to Providence or chance the nose of Cleopatra, or a little grain of sand in the English lord protectors veins, Bossuet held fast to his principle that God works through secondary causes. It is His will that every great change should have its roots in the ages that went before it. Bossuet, accordingly, made a heroic attempt to grapple with origins and causes, and in this way his book deserves its place as one of the very first of philosophic histories. With the period of the dauphin's formal education ending in 1681, Bossuet was gazetted bishop of Meaux; but before he could take possession of his see, he was drawn into a violent quarrel between Louis XIV and the pope. Here he found himself between two fires. To support the pope meant supporting the Jesuits; and he hated their casuists and devotion aise almost as much as Pascal himself. To oppose the Pope was to play into the hands of Louis, who was frankly anxious to humble the Church before the State. So Bossuet steered a middle course. In 1682, before the general Assembly of the French Clergy he preached a great sermon on the unity of the Church, and made it a magnificent plea for compromise. As Louis insisted on his clergy making an anti-papal declaration, Bossuet got leave to draw it up, and made it as moderate as he could. And when the pope declared it null and void, he set to work on a gigantic Defensio Cleri Gallicani, only published after his death. 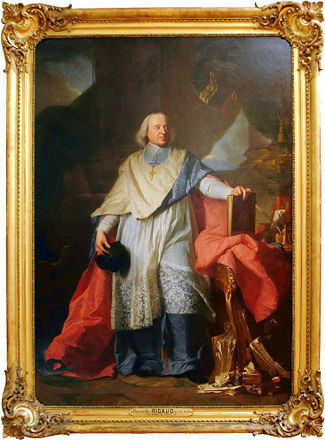 Throughout this controversy, unlike the court bishops, Bossuet constantly resided in his diocese and took an active interest in its administration. The Gallican storm a little abated, he turned back to a project very near his heart. Ever since the early days at Metz he had been busy with schemes for uniting the Huguenots to the Roman Church. In 1668, he converted Turenne; in 1670 he published an Exposition de la foi catholique, so moderate in tone that adversaries were driven to accuse him of having fraudulently watered down the Roman dogmas to suit a Protestant taste. Finally in 1688 appeared his great Histoire des variations des Églises protestantes, perhaps the most brilliant of all his works. Few writers could have made the Justification controversy interesting or even intelligible. His argument is simple enough. Without rules an organized society cannot hold together, and rules require an authorized interpreter. The Protestant churches had thrown over this interpreter; and Bossuet had small trouble in showing that, the longer they lived, the more they varied on increasingly important points. For the moment the Protestants were pulverized; but before long they began to ask whether variation was necessarily so great an evil. Between 1691 and 1701 Bossuet corresponded with Leibniz with a view to reunion, but negotiations broke down precisely at this point. Individual Roman doctrines Leibniz thought his countrymen might accept, but he flatly refused to guarantee that they would necessarily believe tomorrow what they believe today. We prefer, he said, a church eternally variable and for ever moving forwards. Next, Protestant writers began to accumulate some startling proofs of Rome's own variations; and here they were backed up by Richard Simon, a priest of the Paris Oratory, and the father of Biblical criticism in France. He accused St Augustine, Bossuet's own special master, of having corrupted the primitive doctrine of Grace. Bossuet set to work on a Defense de la tradition, but Simon calmly went on to raise issues graver still. Under a veil of politely ironic circumlocutions, such as did not deceive the bishop of Meaux, he claimed his right to interpret the Bible like any other book. Bossuet denounced him again and again; Simon told his friends he would wait until the old fellow was no more. Another Oratorian proved more dangerous still. Simon had endangered miracles by applying to them lay rules of evidence, but Malebranche abrogated miracles altogether. It was blasphemous, he argued, to suppose that the Author of nature would break through a reign of law He had Himself established. In his earlier controversies he had borne himself with great magnanimity, and the Huguenot ministers he refuted found him a kindly advocate at court. Even, his approval of the revocation of the edict of Nantes stopped far short of approving dragonnades within his diocese of Meaux. But now his patience was wearing out. A dissertation by one Father Caffaro, an obscure Italian monk, became his excuse for writing certain violent Maximes sur la comédie (1694) wherein he made an outrageous attack on the memory of Molière, dead more than 20 years. Three years later he was battling with Fénelon, over the love of God, and employing methods of controversy at least as odious as Fénelon's own (1697-1699). All that can be said in his defense is that Fénelon, 24 years his junior, was an old pupil, who had suddenly grown into a rival; and that on the matter of principle most authorities thought him right. Like Bossuet, Fénelon was a bishop who served as a royal tutor–in Fénelon's case as tutor to the Dauphin's sons. The controversy between Bossuet and Fénelon concerned their different reactions to the opinions of Mme Guyon; her ideas were similar to the Quietism of Molinos which was condemned by Innocent XI in 1687. When Mme de Maintenon began questioning the orthodoxy of Mme Guyon's opinions, an ecclesiastical commission of three members, including Bossuet, was appointed to report on the matter. The commission issued 34 articles known as the Articles d'Issy which condemned Mme Guyon's ideas very briefly and provided a brief treatise on the orthodox Catholic idea of prayer. Fénelon, who had been attracted to Mme Guyon's ideas, signed off on the Articles, and Mme Guyon submitted to the judgment. 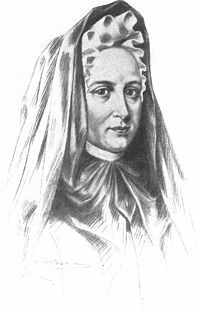 Mme Guyon, cause of Bossuet's dispute with Fénelon. Bossuet now composed Instructions sur les états d'oraison, a work which explained the Articles d'Issy in greater depth. 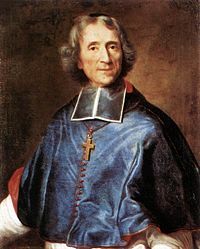 Fénelon refused to sign off on this treatise, however, and instead composed his own explanation as to the meaning of the Articles d'Issy, Explication des Maximes des Saints, in which he explained his view that the goal of human life should be to have love of God as its perfect object, with neither fear of punishment nor desire for the reward of eternal life having anything to do with this love of God. The king was furious when he learned of this and personally reproached Bossuet for failing to warn him that his grandsons' tutor had such unorthodox opinions, and instructed Bossuet and other bishops to respond to the Maximes des Saints. Bossuet and Fénelon thus spent the years 1697-1699 battling each other in countless pamphlets and letters until the Inquisition finally condemned the Maximes des Saints on March 12, 1699. Innocent XII selected 23 specific passages for condemnation. Bossuet had totally triumphed in the controversy, and Fénelon quickly submitted to Rome's determination of the matter. Amid these gloomy occupations Bossuet's life came slowly to an end. Till he was over 70 he had scarcely known what illness was; but in 1702 he was attacked by the stone. Two years later he was a hopeless invalid, and on April 12, 1704 he passed quietly away. His funeral oration was given by the celebrated Jesuit Charles de la Rue. The Catholic Encyclopedia (1913) calls Bossuet the greatest pulpit orator of all time, ranking him even ahead of Augustine and John Chrysostom. The exterior of Harvard's Sanders Theater includes busts of the 8 greatest orators of all time, including a bust of Bossuet alongside such giants of oratory as Demosthenes, Cicero, and Chrysostom. A character in Les Miserables, who is from Meaux and an orator, is nicknamed Bossuet by his friends. ↑ Because of his work on Biblical chronology, Bossuet has been described as one of the last great practicians of a biblically inspired view of history. Cited by Berthoud in his paper on Heinrich Bullinger, Heinrich Bullinger and the Reformation. A comprehensive faith by Jean-Marc Berthoud. Evangelical Library Ltd. Retrieved December 18, 2007. This page was last modified on 13 March 2018, at 15:37.